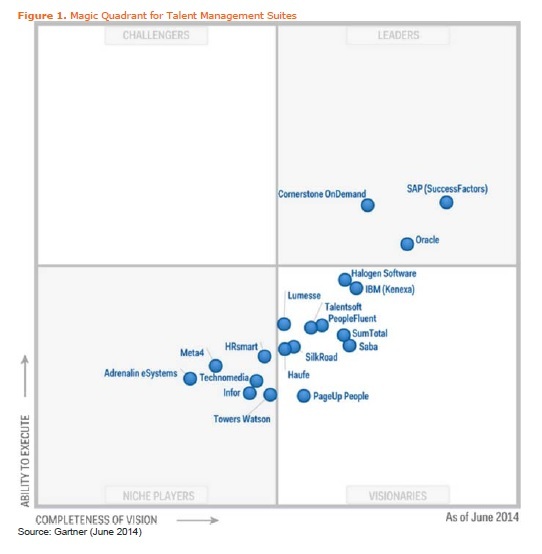 If you are in the market for buying Talent Management Systems, here is the latest Gartner Magic Quadrant. This year, the magic quadrant for talent management suites includes the usual suspects – IBM, Oracle and SAP as well as niche players with strong presence in geographies outside the US. Acquisition continues to be a key strategy for vendors that want to make a presence felt in this market. As new vendors are emerging with specialization on a subset of the talent management canvas, acquisitions will remain an ongoing strategy for all the major players.